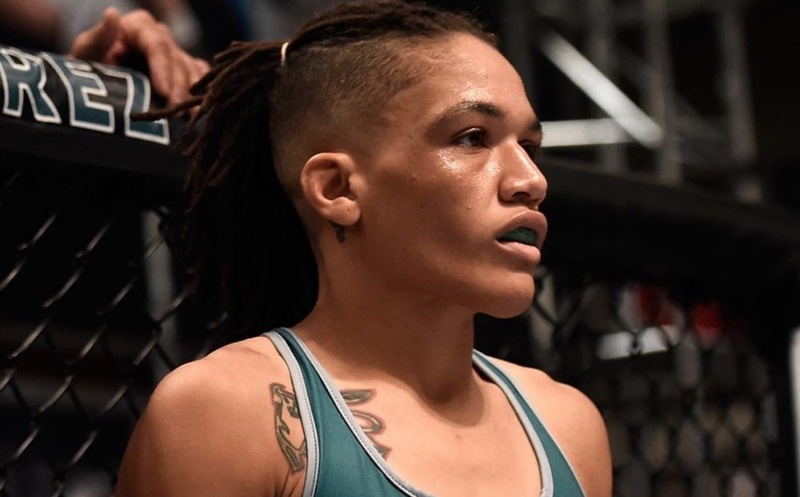 Sijara Eubanks on Joe Rogan: "One day he's gonna find himself in the cage with me"
UFC women’s flyweight title contender Sijara Eubanks has had a major bone to pick with long time UFC color commentator Joe Rogan over some remarks he made about her, and is hell bent on confronting him about it whenever she has her next post fight interview. This all started earlier this month when reports broke that Eubanks was originally set to face Valentina Shevchenko for the now vacant UFC Women’s flyweight championship in the main event at UFC 230. Shortly after the announcement was made, Joe Rogan shared his thoughts on the news via his Joe Rogan Experience podcast where he claimed he apparently didn’t have any knowledge of who Sijara Eubanks was. “No offense, but I don’t even know who Sijara Eubanks is, and I’m the commentator for the UFC.” stated Rogan. Then most recently, it was then announced that the alleged UFC 230 title bout between Eubanks and Shevchenko had been scrapped in favor of a sudden UFC heavyweight championship bout between Daniel Cormier and Derrick Lewis as the main event instead. Following the cancellation, Shevchenko had been re-booked once again to fight for the vacant UFC Women’s flyweight title, only this time against a different and more familiar opponent in Joanna Jedrzejczyk at UFC 231 in Toronto Canada. Far as Eubanks goes, she will remain on the UFC 230 card, as she will now face seasoned MMA/Invicta FC veteran Roxanne Modafferri. In the midst of all this, Eubanks still had not forgotten about what Rogan said about her when the announcement was made that her title fight with Valentina Shevchenko had been cancelled . During a guest appearance on the The MMA Hour with Luke Thomas , she made her intentions clear of someday telling Joe Rogan about those remarks he made about her face to face, next time he interviewed her inside the octagon. If Eubanks is able to defeat Modafferi at UFC 230 next month, we could witness one of the most epic UFC post fight interviews ever.